Book Buds Kidlit Reviews: ROBERT'S SNOW Oy, such a flake! Why you should buy "Jerusalem, City of Peace"
Oy, such a flake! Why you should buy "Jerusalem, City of Peace"
Psssst ... wanna buy a snowflake? Seriously, it's for a good cause. You bid on it, see, and then if you get it, you, umm. I dunno. You hang it on your, uh, Hanukkah bush? You can see my problem. I want to join the fight against cancer, especially after losing my mother in August. But I usually associate snowflake decorations with -- oh my, let's give the War on Christmas a rest, 'kay? Not gonna go there. So thank goodness for Ann Koffsky, a fellow member of the tribe who took a tiny canvass and gave it an interfaith spin, while staying true to the seasonal theme. No mention of what a snowflake reminds me of, though. Just staying in the spirit, is all. Did I pick it, or what? I mean, is this not the most stunning, inspirational -- and really, really small -- tribute to a beautiful place sacred to three great faiths? 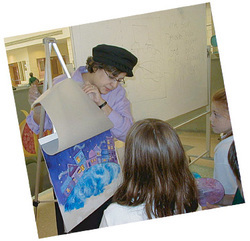 She's illustrated 20 books for children, many -- but not all -- with Jewish subjects, plus toys, calendars and Hallmark greeting cards. How cool is that? First, I cut complex designs from one or more sheets of solid papers. I then shift them around, to create interesting shadows, or matting effects. I then create the painted layer. This part is the most fun, because it usually involves splattering, spritzing, and overall mess-making with vivid colors. To create the final look, I layer the cut out papers over the painted paper. The contrast of loose textures against the clean cut-lines create a visual dynamic that I really enjoy. Ann graciously agreed to answer a few questions about her snowflake, and I tried really hard this time not to sound like a dork. 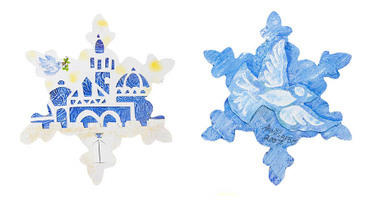 Book Buds: What inspired you to create a vision of Jerusalem for your snowflake? Ann: Well, Christmas seemed to be pretty well covered by all the other illustrators, so I wanted to create something that would speak to a Jewish audience. The hope for Peace in Jerusalem as a symbol of the larger yearning for Peace for all humanity appears over and over in Jewish liturgy and artwork. I thought it would be wonderful to extend the motif into this project as well. How hard was it to cut out such minute shapes for the Jerusalem scene? How long did it take? I love doing papercuts--they have a wonderful quality, and people really seem to respond to them. This one was fun to do, because having the walls of the city project out from the rest of the picture really adds a sculptural effect to the piece--plus the gates in the wall open and close too! Cutting out the shapes didn't take as long as much as figuring out how to have the layers be at different levels--and all on one small snowflake! What was the most fun part of creating your snowflake? Experimenting with the play of cut papers against the textured, blue painted layer. I love setting up contrasts like that in my work. What is it about this medium that first attracted you? Being able to create clean cut lines that can be then layered over 'messy' and textured paints. It's great to be able to be messy and neat in the same piece! What do you love best about illustrating children's books? I find it so meaningful that my work can be used to educate and inspire kids. Nothing beats that. Plus, I can go to work in my pajamas! So there you have it. A cool artist and one hot snowflake. What are you waiting for? Go bid! Bid a lot! Be a mensch! Not only is this a funny, funny post but dang what a beautiful flake! Thanks for highlighting! thanks for sharing this lovely snowflake! Enjoyed this fun-to-read feature (you didn't sound dorkish at all)! Cool snowflake, ala X-acto knife. Thanks. Fabulous! Very funny, and, no, you're not a dork. What a beautiful snowflake -- and the gates in the wall open and close?? Man, I wish I could see it in person. Thankee, one and all. Now go buy my snowflake and make me proud. Except Jules, who is probably knee deep in snow by now. I daresay this could easily be strung in a window on a pretty white ribbon while eight candles glow below! OY! Have I been living under a rock? I always thought snowflakes were nondenominational--even the ones made as decorations. Let's face it--the real ones fall on people of all religions...as long as those people live in areas that have certain kinds of climates. I wonder who first started the association between snow and Christmas??? Was it Currier and Ives? I don't think Bethlehem has ever been plagued with blizzards...even before global warming. Love Ann Koffsky's creation for Robert's Snow 2007. OY! It's gorgeous!!! Elaine: Very good points, of course. Though I do have a funny story associated with snow and Bethlehem. I was in the 6th grade choir (back in 1974 -- am I that old?). Our much-loved choir director had been in the touring company of Godspell and was a religious man. Well, my mother heard that lyric and threw a fit. Pretty soon, word had spread among the Jewish Mothers Network (much faster than the Internet) and before you could say "Oy gevalt! ", all the Jewish kids were instructed to hum the third line. Apparently, in our noisy classroom you couldn't tell the difference. But in a hushed auditorium on the night of the big concert, in front of all our parents and the principal, the walls reverberated with 1/4 of the choir going "When hmm-hmm-hmm was born ..."
Hilarity ensued, as they say, and the chastened teacher dropped the song from the next day's assembly for the rest of the school. We all still adored him, of course. I think these days he would've been suspended, which is sad. I love that the gates to the city open and close. What a great medium to work in. Gorgeous snowflake, and very funny post. You can definitely pick 'em. I love Tadmack's idea. You know, you might have actually convinced me to go and bid on this one. Gosh. Wow. If you do, Bookbk, let me know and I'll post a picture of it in your window! Thanks so much to Ann Koffsky and to BookBuds for the unabashedly Jewish angle of both this snowflake and this post! Robert's Snow is a wonderful project, but I too wish it weren't so dang Christmassy! I would LOVE to see more non-seasonal snowflakes, and maybe even a few Hanukkah snowflakes! Many thanks, Heidi. I really don't mind all the Christmas snowflakes -- many are exquisite -- but I deliberately looked for a Jewish or interfaith one. It's just nice to feel included. Also, I've added your podcast blog to my blogroll. Thanks for finding your way to Book Buds! Anne, thanks for adding The Book of Life podcast to your blogroll, and thanks again for helping me learn about Ann Koffsky's snowflake! Due to your timely post, I'm going to be interviewing her for the Hanukkah episode of the podcast, and I'll give Book Buds a mention too. I looked at your posts tagged "Jewish" and saw some frustrations about finding good Judaic kidlit. I'd like to make you aware of the Sydney Taylor Book Award (presented by the Association of Jewish Libraries), which is the only Jewish book award that focuses exclusively on children's and YA books. In addition to annual medals for picture books, older kids' books, and YA, they also create a long recommended list of Notable Jewish Books. Winners are announced in January, so keep your eyes peeled. More at www.SydneyTaylorBookAward.org.